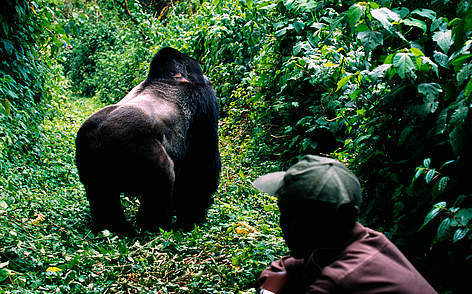 Saving gorillas in the wild is a complex and difficult task - but certainly within our hands. And each of us has a role to play, from policy makers down to consumers across the world. Gorilla conservation programs not only work to protect the gorillas themselves but also help to protect thousands of other species of animals and plants that are found in gorilla habitat. We are working in collaboration with a wide range of partners in several gorilla range states to both conserve gorilla habitat and populations, as well as help improve the quality of life of local people. We are also pushing for policies that help gorillas. The Gorilla Agreement, which is a part of the Convention of Migratory Species, came in to full effect in June 2008 and is the first agreement to legally oblige governments in the 10 countries where gorillas live to work together to combat the threats faced by gorillas in the wild, and find coordinated solutions for gorilla conservation by requiring collaboration on issues such as anti-poaching and law enforcement. 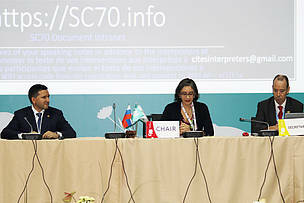 The agreement is legally binding, unlike previous declarations from the range countries, such as the GrASP Kinshasa Declaration in 2005. WWF and TRAFFIC, who are active in gorilla conservation in most of the range countries, were heavily engaged in the negotiation process and final text. WWF is now helping specify specific steps each government can take to ensure gorillas have a secure future in the wild — through direct conservation action in a way that also benefits local communities. As great apes, gorillas are a WWF priority species. WWF treats priority species as one of the most ecologically, economically and/or culturally important species on our planet. As such, we are working to ensure all great apes can live and thrive in their natural habitats. 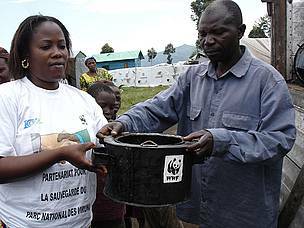 WWF staff member passing out an energy efficient stove in Eastern DRC. These stoves use less fuel so people rely less on wood from Virunga National Park. GRASP is a project of United Nations Environment Programme (UNEP) and the United Nations Educational, Scientific and Cultural Organization (UNESCO) that seeks to ensure the survival of the world's great ape species including all four gorilla species. WWF is an active partner in GRASP along with other NGOs, gorilla range states, international conventions, scientists, zoos, charitable donors and commercial interests in a sustained campaign to protect not only the great apes, but also the ecosystems of which they are part.